A powerful file manager with built in editor, zip file manager(create, extract), jar to jad file maker, support for FTP and Bluetooth file transfers. It’s been confirmed to work on the Sanyo Mirro and work on other Sanyos and phones with memory cards. If you try it on any other phone please leave a comment saying whether it works or not so I can update the supported phones list. The app “MiniCommander” (234 KB) is ready to download or send to your phone as filename: “MiniCommndr”. Who is Yuri Kudrin? Should we not know that person? Its the best app for Java Mobile. It can handle your full requirements. I downloaded it.but i can not know how to create opera mini.Please say me. JAD and JAR are for feature phones, not Android ones like the S5. You need to use .apk files for Android. Best source for them is the Google Play Store. Tries to access the internet 14 times (I counted), every time you start the app. It’s a ditto copy of a paid app called “Moby Explorer”. The 14 internet connections is fishy as hell, as MobyExplorer connects only ONCE. Mini Commander is great! I just downloaded it and it really helps with editing large text files. I’m not a Boost customer. I actually use H2O on a Samsung Ch@boostapps.comt 335 (GT-S3350), but it works great nonetheless. The Ch@boostapps.comt has a strange limitation that prevents the user from editing files in excess of 1024 characters. But Mini Commander works around this. Love it! Either the your phone’s date (especially the year) is set wrong or the certificate in the app has expired. If your date is right try contacting the developer for an updated version. I have this problem when I was downloading apps to my phone and I get this file extraction error. Can I do something about it? I have a sanyo incognito. Thanks if you can respond to this message. Tell me what I’m doing wrong. I have the Mirro and have tried every way possible to download MiniCommander 4.2 and nothing works. The closest I get is the start screen w/the logo, then it’s like it’s frozen. Please help me! There’s not much you can do, these apps either work or they don’t. You could try taking the phone battery out for couple of minutes to reboot the phone OS, that sometimes helps. Another user says MiniCommander on his Mirro. If yours doesn’t maybe you have a different phone firmware version. 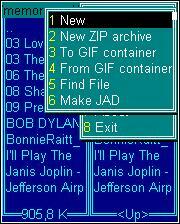 I found something strange when downloading zip files of some java files not offered in jad format, the files will often be empty on my Sanyo Innuendo. Has anybody else noticed this? I cannot download .jar files on my phone because it will use the native browser and give me an invalid file error. That means the only use of this app on my phone is viewing .gif files and using it as a media player. You have to install by clicking the JAD link from within your phone browser. I don’t have a Mirro to test it on but others say it works on that phone. Same result as KrazyKev on my Innuendo. Is the Uncaught Exception error the one that the no-bluetooth version is supposed to fix? The normal version works fine once I select Resume. The no-Bluetooth version is supposed to be for phones that get error with the regular version. If both versions get the recoverable Uncaught Exception error on the Innuendo there’s no advantage to using the no-Bluetooth version on that phone. It’s still 4.2 but has BlueTooth support removed which is supposed to make it compatible with more phones. If it solves the problem please let me know in a comment so I can post it as an alternative. I am using the Sanyo Innuendo by the way. I got the uncaught exception or error alert when I launched this app, but I selected the restart option and it ran just fine. I’ll have to play with it a little to see if everything works though, but it does display pictures with no problem. Hi Denis, the app works on my sony ericsson w910i, and am realy enjoying it.